With the number of accredited PA programs on the rise, access to clinical training sites and preceptors is widely recognized as one of the rate limiting steps to growth of the profession. Clinical preceptors open up their practices to students and spend time educating them on the proper clinical evaluation and treatment of their patients. Clinical teaching is eligible for American Academy of Physician Assistants (AAPA) Category 1 CME credit because it is a self-reflective learning activity for the preceptor and provides invaluable opportunities to advance the knowledge and professionalism of students and providers alike. Preceptors are needed in all areas of medicine, including Behavioral Medicine & Psychiatry, Cardiology, Dermatology, Emergency Medicine, Family Medicine, Gastroenterology, Internal Medicine, Hematology & Oncology, OB/GYN, Orthopedics, Pediatrics, Inpatient & Outpatient Surgery and more! Eligibility is limited to ARC-PA accredited PA programs. 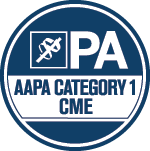 Only PA programs that have submitted an application and received approval are authorized to award AAPA Category 1 CME credit for precepting. Eligibility for AAPA Category 1 CME credit is currently limited to preceptors who are practicing PAs. Preceptors must be fully licensed to practice at the clinical site where the training will occur. Preceptors must disclose any relevant financial relationships with ACCME-defined commercial interests to PA students. All other AAPA CME Standards apply. Approved PA programs may award 0.5 AAPA Category 1 CME credit for each two (2) weeks of clinical teaching. If a preceptor has more than one student at a time, that preceptor may be awarded an additional 0.25 CME credit for each additional student for each two weeks of teaching. PA programs must receive a completed evaluation form from the PA preceptor prior to awarding Category 1 CME credit. The evaluation form may include a self-report and attestation of the number of weeks the preceptor taught as well as the number of students precepted. The form must be completed and submitted by the preceptor requesting credit. For purposes of credit calculation, a week is defined as 40 hours of precepting. PA preceptors cannot directly apply to AAPA for Category 1 CME credit associated with your clinical teaching activities. Please contact the PA program that schedules your students and request that they award eligible preceptors with credit. Demonstration of core medical knowledge about medical conditions for the patients in their area of practice. Demonstration of critical decision making and lifelong learning skills. Demonstration of effective communication with patients and their families, physicians and other health care professionals. Demonstration of high quality health care and a commitment to patient safety. Demonstration of personal responsibility, ethical standards, and sensitivity to diverse patient populations. Demonstration of ongoing evaluation and improvement of their patient care practices. Demonstration of the ability to effectively interact with different types of health care delivery systems. Des Moines University is approved by the American Academy of Physician Assistants to award AAPA Category 1 CME credit to eligible physician assistant preceptors. The approval for the 2017 - 2018 academic year is valid from 6/5/17 - 5/18/18. This program was planned in accordance with AAPA's CME Standards.